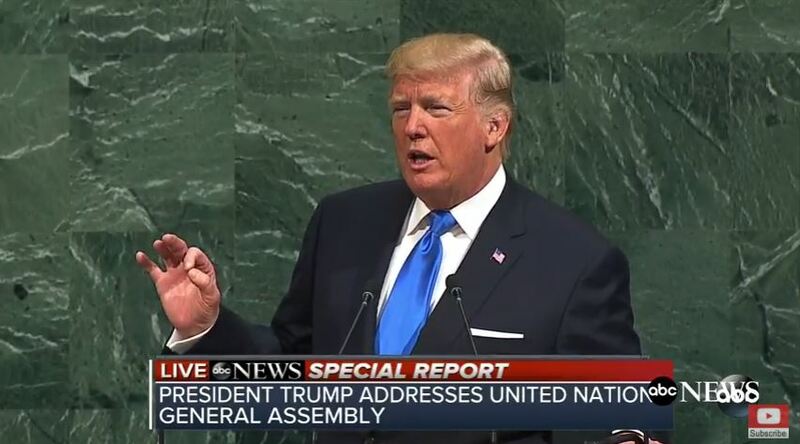 One day after President Donald Trump delivered his no-holds-barred speech to the United Nations General Assembly, a new Rasmussen survey revealed that a plurality of likely voters (46 percent) thinks the United States should not give more money to the organization than other countries. That’s down from 55 percent in a prior survey, according to Rasmussen Reports. The survey also found that 36 percent of likely voters think this country should continue giving more to the U.N. than any other nation, which us up from 29 percent from October 2016. What this survey shows is that the division between Americans is widening over whether the U.N. really does any good. The president didn’t attack the U.N. specifically during his address, but he did challenge members to put their countries first. According to Rasmussen, only 29 percent of likely voters believe the country is getting a good return on its investment, while 44 percent don’t. Twenty-seven percent aren’t sure. Many in the media have panned the president’s speech, while others – predictably at Fox News – have been supportive of his rhetoric. Coincidentally, Politico is reporting that Trump’s polling numbers have “ticked up slightly” over the past month following a decline over the summer months. A Politico/Morning Consult poll found that Trump is back at 43 percent, while RealClearPolitics has him at 40 percent and Gallup has him at 38 percent. Rasmussen’s daily tracking poll has the president at 42 percent. These revelations come after Hillary Rodham Clinton, believed by many to be behaving like the poor sport loser of last November’s election, appeared on the “Late Show” with Stephen Colbert to criticize Trump’s remarks at the U.N.
Clinton is currently conducting what many critics say is a “blame game” tour touting her new book “What Happened,” which seems to point fingers of blame for her loss at everyone and everything. Whatever else the president accomplished Tuesday at the U.N., he drew a sharp contrast between his style and that of his predecessor. Nicknaming Kim Jung Un “Rocket Man,” he bluntly warned the North Korean regime that if the U.S. or any of its allies are attacked it would result in annihilation. While that may have been overboard for a national leader, it also signaled that Washington D.C. is getting tired of Pyongyang’s provocative behavior.